Dare I say mac and cheese is my favorite comfort food? It’s so cheesy and rich, what’s not to like? Even the Velveeta stuff made from a box can seem like a luxurious indulgence. Though let’s be real, it’s nowhere near the luxuriousness that rings through the air when you say “butternut squash mac and cheese”. When I first came across the idea to mix butternut and mac, I immediately bookmarked the idea in my mind as a “must make”. Normally, I don’t ever really cook mac and cheese, whether it be boxed or homemade. Yeah, I love the cheesy goodness, but I try to limit myself to those occasions that arise away from home. Me and a pot of mac and cheese in my kitchen? That would be one dangerous scene. However, I recently had the opportunity to whip up a dish for a potluck, and I knew mac and cheese would go over well with a crowd. With some butternut squash stashed away from this summer’s garden, I jumped on the idea to finally make a version of mac and cheese. Let’s just say I might have gotten a little carried away as I walked out of the grocery store carrying nearly $30 worth of cheese. I was just a little excited to finally be making one of my favorite foods. While the butternut does add an extra boost of nutrition, this is nowhere near the emblem of a healthy meal. It’s got more cheese than could make up the moon, but trust me, every last ounce of it is worth it. More than anything, the butternut adds an extra autumn creaminess and a slight nuttiness that goes perfectly with whole wheat pasta. So yes, with whole wheat and seasonal veggies, at least this mac and cheese has a little more than just deliciousness going for it. Besides, you’ve got to make mac and cheese at least once in your life. Even if you’re vegan, and you find some way to do a dairy-less version. For me, butternut squash was the perfect excuse. Need an excuse of your own? How about a guaranteed crowd-pleaser for the upcoming holiday feastings. Meanwhile, place squash, garlic, broth and milk in a saucepan, and bring to a boil over medium-high heat. Reduce heat to medium, and simmer until squash is tender when pierced with a fork, 20-30 minutes. Remove from heat. Place contents of pan in a blender, along with salt, pepper, paprika and yogurt. Blend until smooth. Once pasta is finished, drain and return to pan. Add squash mixture. Stir in all four cheeses* and cook over low heat, until cheese is melted, stirring frequently. Serve, topped with a dash of paprika. *If not eating immediately, reserve a handful of Parmesan. To reheat, place in oven at 350F topped with reserved Parmesan and sprinkle of paprika. This is pretty much the same recipe I posted, just minus the Nutritional Yeast, however yours looks different (And of course your picture looks much better!). I have had several people tell me that they LOVE this recipe! give this to meee please. This looks and sounds marvelous!!!! Yum! oooo! Mac & Cheese is never a bad idea for potluck! Never! It’s always so welcomed! and 4 cheese?! with butternut squash… we know who’s gonna be popular that night! Love the twist with the butternut squash! You should try butternut squash soup if you like the butternut squash flavor! sounds like such a delicious combination! 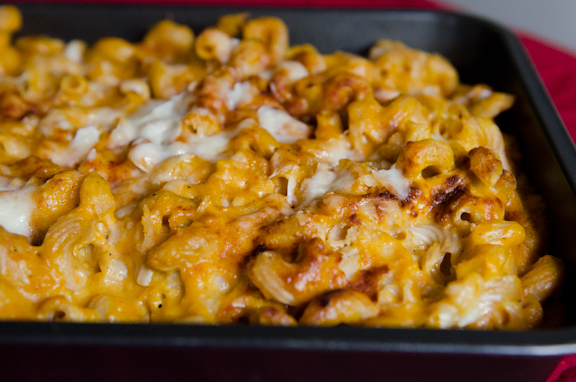 I haven’t made mac & cheese in ages, but this is making my mouth water…. Butternut squash and mac and cheese, two of my favorites combined! What’s not to love?